The man who seven months ago predicted the demise of Test cricket has gone far to sparking its revival. By carrying his bat through an attritional fourth day in Adelaide, Chris Gayle proved not only that his passion for the five-day game still runs deep, but also positioned West Indies for a victory charge that would capture the attention of the world and the imagination of the Caribbean's long-suffering fans. Gayle has been demonised for his controversial views on Test cricket and typecast, not without reason, as a Twenty20 mercenary. Strike action and a series of 11th-hour arrivals ahead of major international matches prompted many commentators to wonder whether his commitment was to West Indian cricket, or the Allen Stanfords and Shah Rukh Khans of the world. Even the West Indies chief executive, Ernest Hilaire, expressed reservations over his suitability as captain. But over 411 sweat-soaked, muscle-cramping, concentration-sapping minutes, Gayle confirmed his desire to lead West Indies through this darkest of periods. His unbeaten 155 on a testing wicket was a triumph of patience and determination - traits many had forgotten he possessed - and went far to demystifying the Australian attack before the eyes of his young, eager team-mates. "That innings from Chris was unbelievable," the coach David Williams said. "It's very difficult scoring on that track and it was evident in the way Chris played. He doesn't normally play like that. But he had to conserve his natural play and try and stick around. We know that scoring is very difficult on that wicket." Gayle set the tone for a West Indian revival when, barely an hour after Australia had sealed an innings and 65-run victory at the Gabba, he called a team meeting that stretched long into the night. Rather than allow the disappointment of defeat to fester within the playing group, Gayle and the team management outlined a blueprint for success that emphasised the need for more accountability among the batsmen and greater leadership from the team's veterans. The difference in the tourists was evident from the opening session in Adelaide. A resolute first innings batting performance was supported by a superb bowling effort, in which Gayle displayed a gambler's flare for field placings and bowling changes. West Indies' responded positively to their captain's adventurous tactics, and Gayle provided further cause for optimism with an inspired second innings century that might just prove the catalyst for the breaking of their nine-Test losing streak on Australian soil. 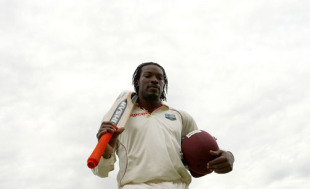 Gayle has played more prolific, fluent and explosive innings over the course of his 84-Test career but few as important in the context of the match and the general state of the game in the Caribbean. By curbing his innate need to dominate at the crease, he produced a substance-over-style innings that should serve as inspiration to his team-mates, and made plausible a victory that barely a week ago appeared improbable in the extreme. "That's Chris, he plays his game very seriously," Williams said. "He's a very determined guy. Look back at Chris over the past year or so, he's played extremely well in the Test matches that he's played. It's just a matter of leading the guys the right way." Caribbean fans have experienced too many false dawns to lose themselves completely in this moment, but after the year that's been, they at least have cause for positivity. Win, lose or draw, Gayle and his team have proven they possess the competitive desire and raw talent to compete with the world's best. And that is a cause for celebration in itself.